Boykin Spaniel is an American breed developed in South Carolina as a multipurpose retriever. Ancestors include the Chesapeake Bay Retriever, as well as several different spaniels and a stray of uncertain parentage who was a versatile hunting dog. The breed has been used to flush game, retrieve on land and in the water, and track wounded deer. The breed is the official state dog of South Carolina. The Boykin Spaniel is a small retriever and stands only 15 to 18 inches tall and weighs 25 to 45 pounds. She is smaller than the Cocker Spaniel (one of her ancestors), has a straighter muzzle, and has ears set higher than the Cocker’s. The tail is docked, and the coat is wavy to curly and is brown or liver-colored. The Boykin Spaniel’s coat needs regular brushing to prevent matting. If the dog gets wet, she should be dried and brushed; otherwise, brushing every other day is fine. Her ears need regular cleaning to prevent ear problems. Her coat will need trimming every four to eight weeks. This dog breed is active and energetic. 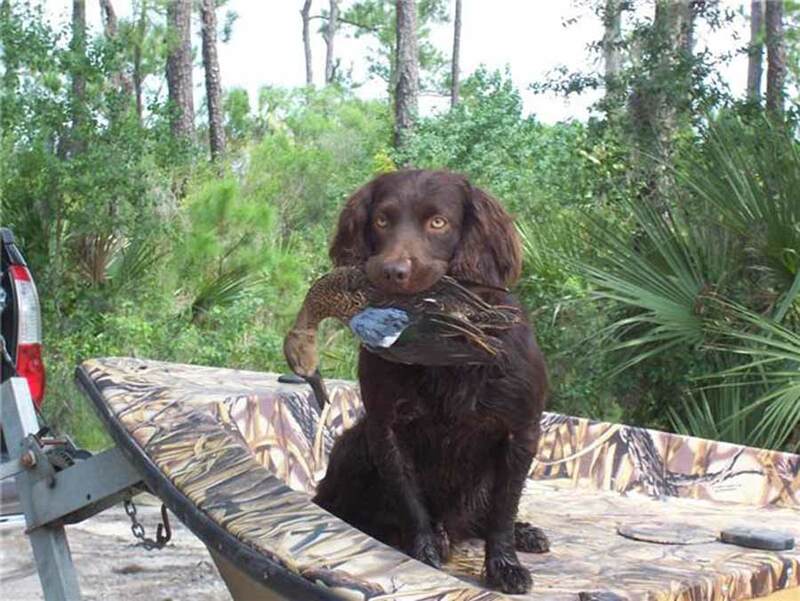 When hunting, the Boykin Spaniel will go all day long; as a pet, she will need vigorous daily exercise. If not provided with enough exercise, she will amuse herself in ways that rarely please her owner. The breed loves water. Many dogs participate in a variety of canine sports. Boykins are known for their pleasant disposition. Early training can help channel their energies, but for the most part, this breed is more compliant than defiant. Keep in mind, though, as an instinct-driven hunting breed, the Boykin can become distracted by the sight and scent of critters, so all offleash exercise and training should be in a fenced yard. The Boykin Spaniel is not a city dog; the breed does best in a rural environment, preferably one where her owner likes to hunt. With plenty of exercise and room to run, she is also a good family dog and is very tolerant of children. She should not be trusted with smaller pets. Health concerns include hip dysplasia and allergies. Share your Boykin Spaniel story. Note: Upload only Boykin Spaniel picture or your picture with Boykin Spaniel below - spammer's ip may be blocked.